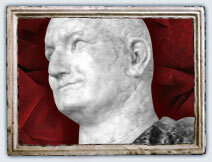 Vespasian (9 – 79 AD / ruled 69 – 79 AD) worked hard to restore law, order and self-respect to Rome after the civil war. He established the new, Flavian dynasty. Born to a Roman knight and tax-collector, Vespasian was a man of relatively humble origins and played on these roots to great political advantage. Vespasian’s early career was spent mainly in military service. After distinguishing himself during the invasion of England in 43 AD, he was given his first military command. Further success led to more honors and, in 51 AD, he became consul in Britain. In 63 AD, Vespasian was appointed proconsul in Africa. Here, he controlled the budget so tightly that, on one occasion, the locals pelted him with turnips. Four years later, in 67 AD, Nero appointed Vespasian to put down the Jewish rebellion in Judaea. His success here, where others had failed, meant that, by 68 AD, Vespasian was one of Rome’s most successful generals. His humble origins had led Nero to believe that he was no threat. While Nero was alive, this was true. But then Nero died. After the murder of Galba, civil war was inevitable. What’s more, Vespasian had as good a claim to the throne as his two main rivals, Otho and Vitellius. In July 69 AD, Vespasian was proclaimed emperor by his troops, as well as legions in Egypt and Syria. He marched on Rome. Once in Italy, they found themselves facing Vitellius’ army: for the first time in 100 years, their enemy was Roman. By morning, Vespasian’s army had won the battle. They ransacked a nearby town and marched on, reaching Rome in December. The city became a battleground, with its citizens caught in the crossfire. Around 50,000 people were killed before the battle was over. Vespasian had won and, with no one left to fight, he was proclaimed emperor by the Senate. Vespasian was honest about the source of his power – military strength. Using his new position to grant himself more powers, Vespasian immediately began talking up his humble origins and publishing the divine omens he claimed had predicted his spectacular rise. Finally, he wasted no time establishing his dynasty, insisting that his two sons – Titus and Domitian – would succeed him. Next on the agenda was the need to restore war-torn Rome to something approaching its former glory. One of the first jobs was to raise money: Nero’s extravagance and the civil war had almost ruined Rome. By raising taxes and reclaiming public land, Vespasian was able to fill the city’s vaults with cold, hard, cash. He used some of this money on a massive building program, which included temples, a theater and early work on what would become the Colosseum. He then turned his attention to the army. In a wholesale reorganization, he restored discipline, removed officers loyal to Vitellius and ended the war in Judaea. In Britain, he conquered Wales and northern England. All the time, Vespasian was changing the traditional image of the emperor. He approached his work with an earthy humor and common sense unusual in someone of his rank. More importantly, he provided the first real stability since Claudius, 20 years earlier. Although he had gained his position through violence and was still a military dictator, he legitimized himself and his dynasty by offering Rome a stable, peaceful future. By 79 AD, Vespasian was dying, but his sense of humor remained intact. "Oh dear!" he joked, mocking the Roman tendency to turn dead emperors into gods, "I think I'm becoming a god." Vespasian had brought Rome through bitter civil war and left the empire stronger than ever. But by declaring, "My sons will succeed me, or no one will”, Vespasian had ignored history and his own experience. Like his predecessors, he insisted on tying Rome to the lottery of hereditary rule.